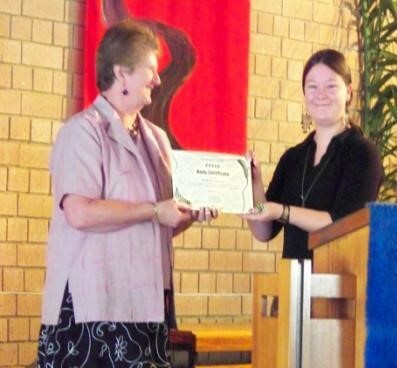 This sermon was delivered at Springwood Uniting Church in NSW on the 17th of April 2011 (Palm Sunday) on the occasion of the presentation of their Five Leaf Eco-Awards Basic Certificate. Today we celebrate Jesus’ triumphal entry into Jerusalem riding on the back of a donkey colt as he walked over the branches put before them. It is a happy occasion, one we like to re-enact by playing with palm fronds and donkey costumes. But have you ever thought about what we might get out of the story if we looked at it from an environmental perspective? According to the Christian Ecology Link, Jesus’ use of the donkey demonstrates his peaceful and positive mission which includes all God’s creatures and the use of the branches on the road can be linked to the sustainable use of plants and flowers to decorate our churches to the glory of God. But what I want to focus on today is stones that shout. As a kid, I really liked that last verse. The idea of stones shouting was so exciting I kinda wished the disciples might have been quiet for a bit, just so the Bible could record the stones themselves actually praising God. Alas, we will never know what the stones would have said, but their readiness to step forward and praise God is significant. Jesus is basically saying that if his human disciples fail to bring sufficient glory to God, the rest of creation will take up the call. Then shall the trees of the forest sing for joy”. As he often did, in our passage from Luke Jesus has extended the Old Testament understanding to fit a higher ideal. Psalm 150:6 in the Old Testament says, “Let everything that breathes praise the Lord” but Jesus corrects this, bringing even the inanimate objects of creation, like stones, into the family that praises the Lord. We in the church have a tendency to think of ourselves as the main source of the praise and worship God receives, but in truth, all our praise makes up only a tiny fraction of the total. Just think about it, even though it is beyond our senses, every single rock, tree, bird, fish, blade of grass and stick is singing praises to God. It boggles the mind, doesn’t it? What an incredible chorus of praise that must be to hear, if we had the ears of God. Of course, this praise is probably not actually in the form of a song. It has been suggested that animals praise God by existing, and by being true to their own design and nature. So a beaver building a dam is praising God, but so is a wolf pack hunting for a deer, or a plant growing towards the sunlight. So we know that creation praises God faithfully, but it also brings us to praise by bearing a constant silent witness to God for all humankind. In the days before missionaries covered the world, the only way people could know God was through creation. According to Iranaeus (120-202) “the initial step for a soul to come to knowledge of God is contemplation of nature.” Even now, many people come to believe in God through nature before they understand God in a more church-related way. Others, hurt by the church or those in it, find comfort and continuing reassurance of God in nature. In contrast, few of us find inspiration in rubbish dumps, grey city streets and recently logged forests. For myself, nature has always been the wellspring of my faith, and a constant call to prayer. Every time I see those rays of sunlight breaking through the clouds that they call the fingers of God – I praise the Lord. Every time I run into a plant or creature, even if it is just a beautiful little insect – I praise the Lord. When I see the seedlings in my garden grow – I praise the Lord. In the sunset, the rain and the waterfall – I see God, and it calls me to praise. I cannot immerse myself in a beautiful forest or grassland without my thoughts turning into a litany of praise. Trap me in a concrete jungle for long enough, I get depressed and my faith life suffers. Many people respond to nature the same way I do, but not everyone does. We all have our different sources of spiritual connection with God – mine just happens to be nature. But whether yours is or not, it is important to reflect on our actions that impact the environment in the light of the large group of people who suffer spiritually, in addition to physically and psychologically, when nature is degraded. But what if it is not only animals and people, but God who suffers from environmental degradation? My reflections on creation’s praise of God have led me towards some challenging thoughts. We believe in a great and almighty God. All loving, all powerful, all present, all knowing. A God worthy of praise right? Indeed, not just a God worthy of praise, but a God worthy of as much praise as possible, of all praise. So when I look around and see the destruction we have wrought upon the planet and its creatures, I have to ask – do we have the right to take away God’s praise and worship like this? Because when we kill an animal – be it tiger, shark, elephant or ant, we are removing a creature that praises God. The next question that raises for me is what happens when we wipe out a species? Does every species have its own unique song or vocal range (like a soprano or an alto in a choir), which we are removing completely from the orchestra when they go extinct? How does God feel about the way this simplifies the tune and reduces its depth? We know God values diversity, otherwise why would God create an estimated between 5 and 8 million species of beetle alone? I don’t have the answers to these questions, but I keep them in mind as spurs for action. They remind me how important the work I do for the environment is, and keep my passion for working to save endangered species from extinction alive. So we have started with a celebration, but progressed to something more serious. The triumphant procession of Palm Sunday was a brief window of celebration and joy before Jesus faced the more serious work of the cross. In a similar way, our celebration with, and inspired by, creation has no meaning if it does not inspire us to act. Think about every part of nature as belonging to God and praising God. As a Christian, does this change the way you believe you should relate to God’s creatures, and act as steward of the earth’s resources? Through prayer and reflection, think about how you might act on this. The good news is we are not alone. All around the world, Christians and the Church are rediscovering their connections and indebtedness to nature. Particularly in the UK and US, large movements have started to re-embrace creation theology and more peaceful ways of relating to the environment around us. The church is gearing up to play its part in finding solutions to the ecological crisis, helped along by the belief that at its root, this is really a spiritual crisis. James Sire (Forward in Van Dyke et al. (1996)) says, “In 1967 Lynn White in his essay ‘The historical roots of the ecological crisis’ laid the responsibility for the crisis squarely on the shoulders of Christians and what he took to be the biblical view of nature. A case can certainly be made that Christians bear a major responsibility for our ecological crisis. But the fault is not their biblical but their unbiblical view of nature. Christians have long failed to understand what the Bible really teaches concerning nature and our responsibility for it. For this there is no excuse. Repentance must be our first response. Here in Australia, we are fighting as well, and churches like yours are leading the way in coming to more sustainable and eco-friendly ways of being church. This has brought me here today to present you with the Five Leaf Eco-Awards Basic Certificate for your work in greening your buildings, worship, congregation, outreach and leadership through actions like your water tanks, solar panels and guest speakers. The Five Leaf Eco-Awards are a pilot ecumenical environmental change program for churches and religious bodies that provides assistance, inspiration and recognition for environmental achievements. There are currently about thirteen churches involved in the program and several more in process of applying for awards. It’s early days yet, but I am excited by the progress we have made so far. So I wanted to say ‘hi’ today, congratulate you for your achievements, present this award and encourage you to keep fighting the good fight. Please give yourselves a round of applause. And I hope you will invite me back to present you with more awards in the near future.